Spotlight Amusements is proud to Offer our Schools and Families of our community a chance to participate in this great money saving offer, Spotlight Birthday Club is for you to have a great discount for your individual birthday parties and events, by choosing the #1 Family fun Company in our area! 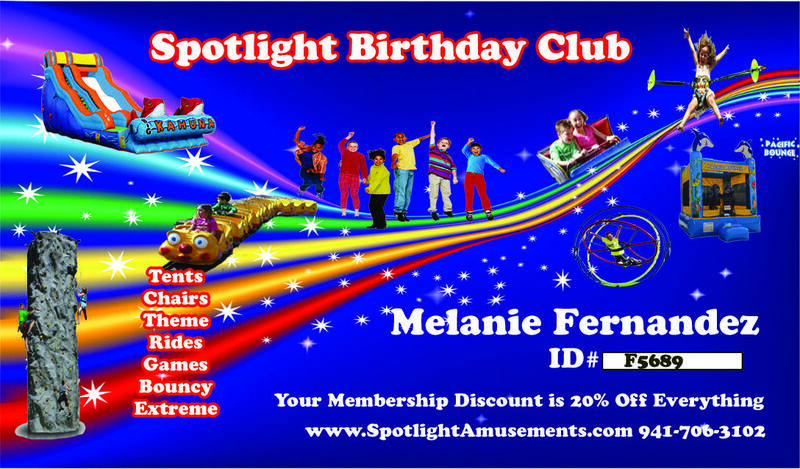 Spotlight Birthday Club is a new and fun spot to go to for planning, equipment, and ideas for your kid’s birthday(s). Not only do we have the resources to put together whatever you can dream of, but we also have the friendly staff to put it together at your time and need. Joining Spotlight Birthday Club is a great way to have access to hundreds of discounts to all your party needs and your friends and family throughout the year. Birthdays can be very expensive and they are a must have, no one wants to disappoint their kids by not having a birthday party for them. The Spotlight membership does not restrict you to having the party at your home there are a wide variety of venues that spotlight works with to host your event at various locations if needed including: recreational centers, county parks and venues throughout Sarasota/Bradenton Area. Join over 100 families that are already part of the Spotlight Birthday Club receiving hundreds of dollars of discounts at each and every one of their child’s birthdays. Each member of our community will have their own unique Spotlight Birthday Club Card with their own unique promo code sent to you by mail. Using your promo code not only allows us to track the percentage to send back to the school but also gives you your own unique identity for you to access your account and view all of your savings with your membership. Each member of our community would have the same ability to order online using Promo Code: ####### and receiving your discount instantly. Our computer software will identify you immediately, giving you a 20% discount and sending a check for 10% to The School of your choice, what a great way to fundraise! please make sure that you entert the schools information at the sign up of membership.